Black graduation stoles with teal trim is an exceptional way to go, the darkness of the black livens the teal perfectly for a great contrast. Your graduation is creeping up fast, be sure to get all of your attire in time for your ceremony. Here at Honors Graduation we have everything you might want or need to look stunning on this significant day in your life. As your family and close friends come together to help you celebrate your success, you will be able to accept your degree or diploma in confidence knowing that you look spectacular. It is traditional for graduating students to wear a graduation cap and gown at the time of their ceremony and they typically accent their outfit with tassels, cords, and stoles. We have all of the basic gear that you need to meet the requirements most schools have in order for graduates to walk at their ceremony. In addition to our package deals for your graduation cap and gown we also have various accessories to add the finishing touches to your wardrobe. Graduation stoles are a great way to represent yourself at your ceremony. Whether you are a member of a special club or want to stand out, we have the perfect stole for you. At Honors Graduation we offer variety when you are selecting your graduation attire. 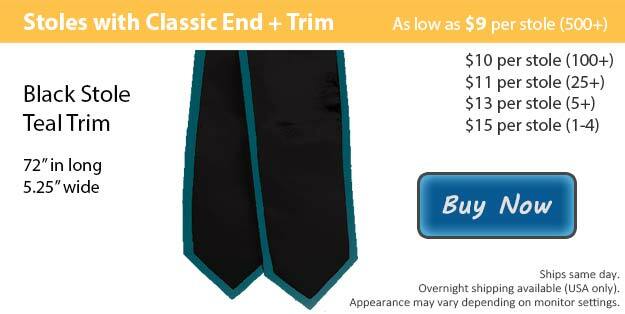 Choose between our angled cut or the classic finish for your graduation stole. We have over 15 different colors to choose from, allowing you to mix and match. Each style of stole that we carry is also available without trim as well so you can create the perfect stole for your graduation. If you wish to add a logo or custom design to your stole, we can embroider it for you for a small additional fee.